The website www.ual.es, as well as the Internet domain ual.es, and all the domain names leading to it are the property of the University of Almeria. The website of the University of Almeria offers all types of contents and services related to the normal activities of the University of Almeria - teaching, research, culture, sports, etc. These contents and services are offered, in each case, to the general public and to the members of the university community who are duly authorized. Contents publicized by this means are sole informative, the University reserves the right of eliminating or suspending their entire or partial publication with no prior notice, and may even limit or not allow access to said information. These contents in no way substitute the legal publication of acts and provisions which should be formally published in the official gazettes, or the notification of acts dictated by the University within an administrative process. The contents of webpages or systems of third parties outside the domain ual.es which are linked from the University website. Damages which may derive from disconnections of the electronic system, telephone breakdowns or interferences, computer virus, malicious software or any other factor outside its control. 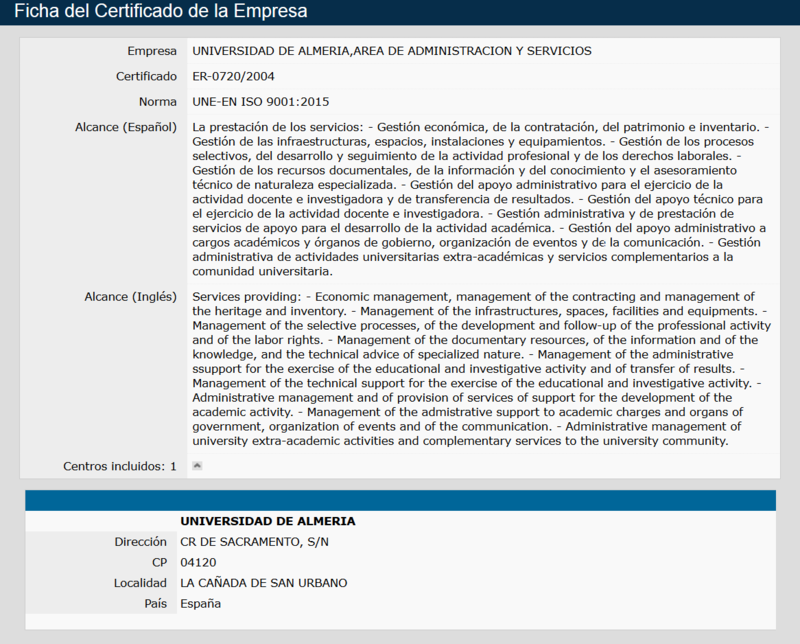 All contents of the University of Almeria website are protected by the appropriate intellectual and industrial property rights, and they belong to the University of Almeria or to agencies related to the same, or to third parties who have given authorization to the University for their use. Moreover, the University of Almeria reserves the possibility of applying a specific regulation to certain contents offered from its domains. Said regulation will prevail above the regulation established in this legal notice in case of conflict between both texts. Personal data which the University of Almeria requests users will be treated in conformity with the principle of personal data protection established by Organic Law 15/1999, of 13 December, of Personal Data Protection.